For years, sperm whales and elephant seals were thought to hold world records for holding their breath under water. But those animals have nothing on beaked whales. Using digital tags temporarily suction-cupped to two species of beaked whales, researchers led by scientists at Woods Hole Oceanographic Institution tracked Cuvier’s beaked whales diving to depths of nearly 6,230 feet (1,900 meters) and staying down for 85 minutes. They also documented smaller Blainville’s beaked whales diving 4,100 feet (1,250 meters) for up to 57 minutes. “These data establish beaked whales as the extreme breath-hold champions of all animals studied so far,” said WHOI engineer Mark Johnson, who developed the “D-tags,” which record whale movements, their echolocations, and other underwater sounds. Working with colleagues from the University of La Laguna in Spain, the University of Aarhus in Denmark, BluWest, and the NATO Undersea Research Center in Italy, WHOI scientists tagged and studied seven Cuvier’s beaked whales (Ziphius cavirostris) in the Ligurian Sea off the coast of Italy and three Blainville’s beaked whales (Mesoplodon densirostris) off the island of El Hierro in Spain’s Canary Islands in 2003 and 2004. Both sites boast gaping undersea canyons that plunge more than 6,500 feet (2,000 meters) below the ocean surface. Data from the D-tags (see “D-Tagging Along with Whales,” below) may help answer questions surrounding possible impacts of sonar testing on beaked whales, which have been found stranded with symptoms of decompression sickness after naval exercises in both regions. The information has also shined light on the dark and mysterious world of beaked whales. Tyack said the beaked whales’ diving capacity outmatched reigning breath-hold champions such as sperm whales and elephant seals. Sperm whales, which have been studied far more extensively, can dive for more than an hour to depths greater than 4,000 feet (1,200 meters), but typically dive for 45 minutes to depths of 2,000 to 3,280 feet (600 to 1,000,meters). Elephant seals, can spend up to two hours in depths nearly 5,000 feet (more than 1,500 meters), but typically dive for only a half-hour to 1,640 feet (500 meters). The beaked whales dive deep to feed on squid and deep-water fish. During deep dives, hydrophones on the D-tags recorded regular echolocation clicks and buzzes, as well as echoes of what appeared to be prey—strong evidence that the whales were using echolocation to forage. Accelerometer and magnetometer sensors on the tags combined with the hydrophones to indicate that the beaked whales are highly selective about what they eat. They pass up echoes from hundreds of targets before selecting one to capture and eat. On at least one occasion, two whales descended in tandem and foraged in the same general vicinity, feeding independently but remaining close enough to keep acoustic tabs on each other by listening for each other’s clicks, Tyack said. In his lab, Tyack played a computer file that juxtaposed whale movement and audio data collected by the D-tags. The file show dots (representing whales) descending and making regular series of echolocation clicks in search of food. Every now and then, the clicks accelerate, indicating moments when each whale found and tried to catch prey, Tyack said. Scientists observed that beaked whales only engaged in echolocation at the very deepest parts of their dives, and that these clicks had little energy below 20 kiloHertz—well beyond the human hearing range. To Tyack, these data suggested that the animals were doing their best to remain undetected by predators such as killer whales and white sharks, which generally patrol only the uppermost reaches of the water column. The data also indicate that after their deep dives, the whales ascend slowly. This behavior is mysterious because the animals, being breath-hold divers, don’t have to ascend gradually to avoid decompression as scuba divers would: Underwater pressure below 330 feet (100 meters) collapses the animals’ lungs, preventing gas from entering their blood, Tyack said. 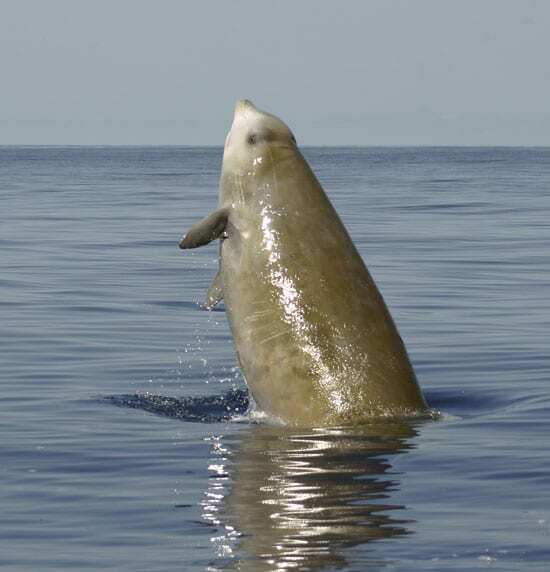 Despite the whales’ physiological adaptations to avoid decompression, necropsies on beaked whales that stranded after recent sonar testing showed that the animals had symptoms consistent with decompression sickness. Tyack hinted that sonar may provoke behavioral changes that make whales vulnerable to stranding. Tyack said it is imperative for scientists to help reduce the impact of sonar on whales in the future. In their ongoing efforts, he and colleagues will use hydrophone arrays off the Bahamas this summer to detect the telltale echolocations of beaked whales and conduct controlled experiments to measure how beaked whales respond to sonar-like sound stimuli. Meanwhile, Johnson, is working on a kind of “distant early warning system” for beaked whales that could help alert navy personnel to the presence of beaked whales before they start the sonar. 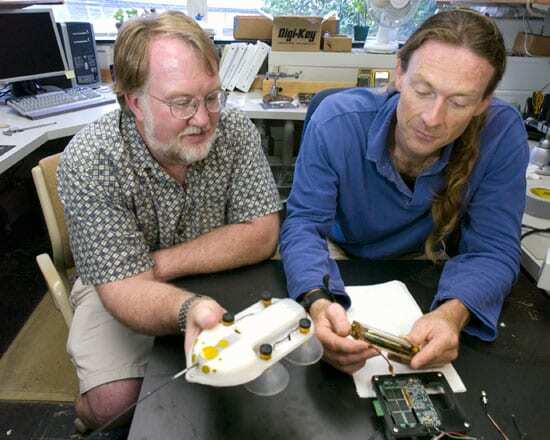 Funding to develop D-tags was provided by a Cecil H. and Ida M. Green Technology Award at WHOI and the Office of Naval Research. Funding for the beaked whale fieldwork came from the Strategic Environmental Research and Development Program, the National Ocean Partnership Program, the Packard Foundation, the Canary Islands Government, and the Spanish Ministry of Defense. BluWest, the NATO Undersea Research Center, and the Government of El Hierro provided fieldwork support. They’re smaller than a sandal and not much more technologically sophisticated than an iPod, yet D-tags have revolutionized the way scientists study whales. The tags, invented in 1999 by Woods Hole Oceanographic Institution engineer Mark Johnson, are instruments that record the movements and sounds made by marine mammals, and the sounds around them in their inaccessible underwater environment. Johnson developed the tags to get a better sense of what whales were doing in the depths. Today, WHOI scientists are using them to do just that, incorporating the technology into research projects involving beaked whales, sperm whales, and orcas, to name a few. The hardware behind these feats consists of hydrophones to capture sounds up to 196 kiloHertz, as well as an accelerometer and magnetometer to measure the animals’ orientation 50 times a second as they are swimming. It also includes 6 gigabytes of memory, a battery that lasts up to 24 hours, and a saltwater switch that turns on the device the moment it hits the water. Technologically speaking, Johnson said some these components are not much different from those found in popular portable digital media devices like the iPod. 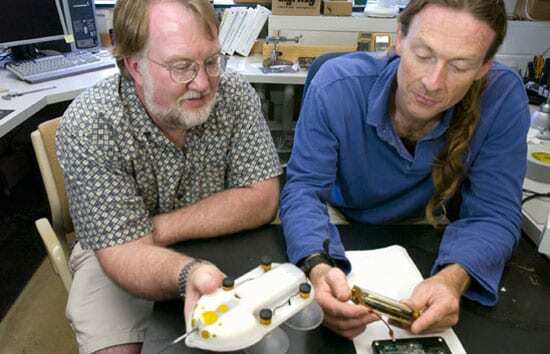 He noted that future generations of the device also may incorporate Global Positioning System receivers that can take a waypoint every time the subject animal surfaces. “The more functionality we can add, the better,” he said of the $3,000 device. None of these whiz-bang gizmos would survive the deep sea without protection from the pressure. With this in mind, the technology is encased safely in a cell phone-sized polyurethane case filled with oil. The case attaches to a whale for an average of eight to 12 hours with a set of silicone suction cups. Scientists approach by boat and affix the device with a handheld pole. Of course the act of applying a D-tag isn’t easy; currently, Johnson said there are only a handful of researchers who know the technique. As the tags become more widespread at WHOI and other research institutions around the world, he said he plans to host workshops to straighten the learning curve.